Highlighted features such as 1-click root, gif maker, ringtone maker. Are you bored hearing those common ringtones of your cell phone? If you are using android phones you have many options to make it more fun and exciting. There are many free applications available on internet where is absolutely free. You can browse through unlimited ringtones and alert tones with the use of these apps and can also customize your own ringtones. 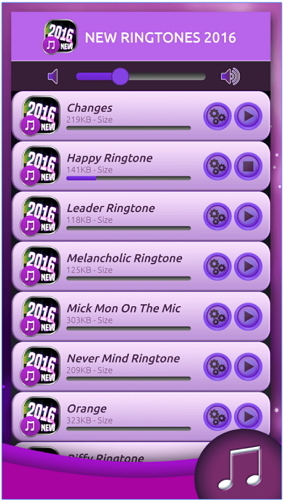 If you are looking for latest ringtones for your brand new phone then Top 2015 Ringtone is the best app. You will get the collection of all the top sounds which can be used for both call ringtones as well as SMS alerts. No 3G or Wi-Fi is needed and is easy to search ringtones. You will love the collection of funky and crazy ringtones, so try now! 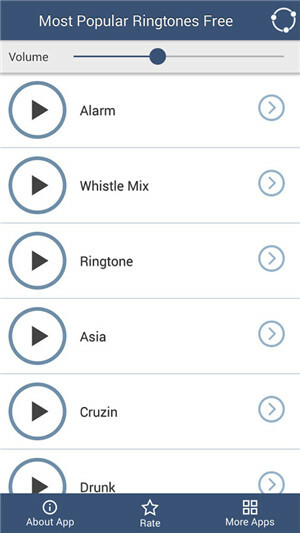 Audiko ringtone is the best free ringtone app for android phones. It gives you a wide collection of National top charts. 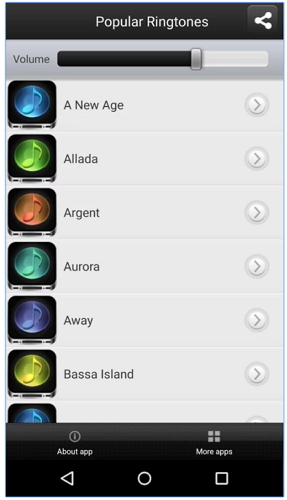 You can also use it to create your own ringtones from the music stored in your phone library. The collection is full of latest popular, hottest ringtones and free alerts. At New Ringtones 2017 you can download large collection of high-quality free sound effects for android phones. It contains thousands of latest ringtones which are easy to download. Not only this, you can also download notification alerts and amazing sound effects for SMS tones. You can customize different ringtones for all your contacts individually. So we have another free ringtone app for android, which is really amazing to use. 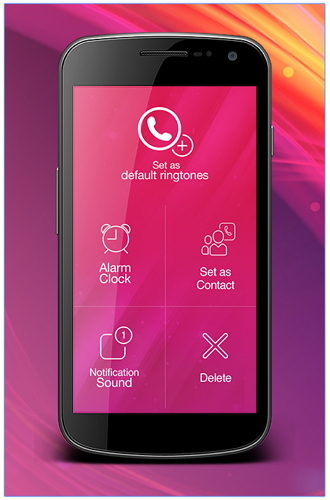 Ringo is a fun app where you can customize ringtones for incoming call and SMS alerts. The best feature of the app is, it includes caller and SMS announcers. 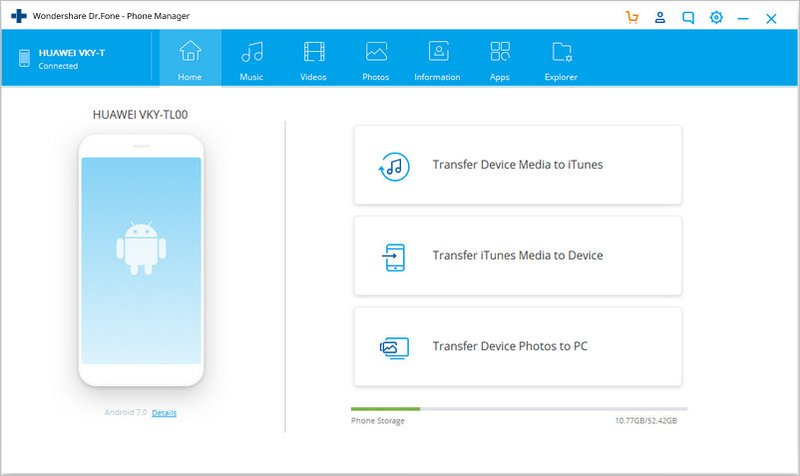 The size of an app is really small upto 2.8M which can be easily downloaded and won’t take much of phone storage space. 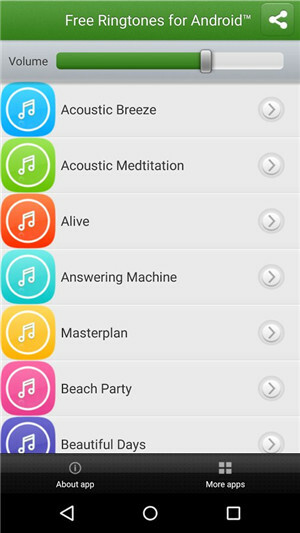 The next app which is on the list is MP3 cutter and ringtone Maker, where you can use your music list to set as ringtones. Simply select the audio file cut the best part of the song which you want to set as your ringtone and enjoy it. You can also use live record feature and use it as your caller tone, SMS tone or notification alerts. Yes, you are thinking right! 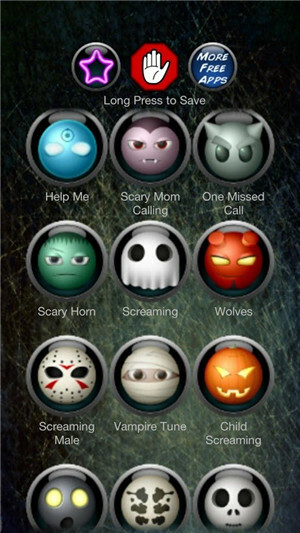 As the name suggests, at Scary ringtones, you will find huge collection of scary sounds which can be used as ringtones/SMS alerts. It can also be used as email alerts, alarms, notification and more. So if you want to scare your friend for fun, use this crazy app. This app is best for all those who are looking for crazy sounds for SMS alerts and other notifications such as alarms and ringtones. It is easy to us and you will find all the latest funny text messages tones. It works on tablet too and the tunes can be used for email and other alerts also. 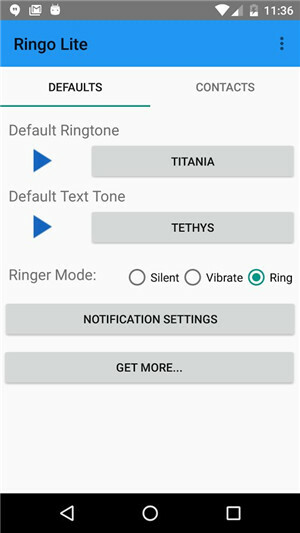 Another ringtones app for android which is best suited for notifications, alarms, email alerts, txt messages sounds, warning calls and many more. You can also assign ringtones to specific contacts. 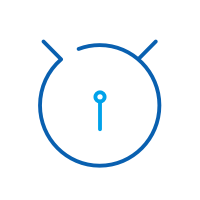 It is daily updated and every time you get fresh sounds to keep your android phones entertaining. 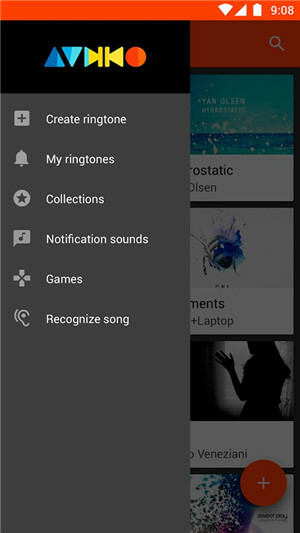 If you are looking for latest ringtone apps for android, Most Popular Ringtones free, is what you need. You will get all the latest ringtones and alerts for free in high quality. 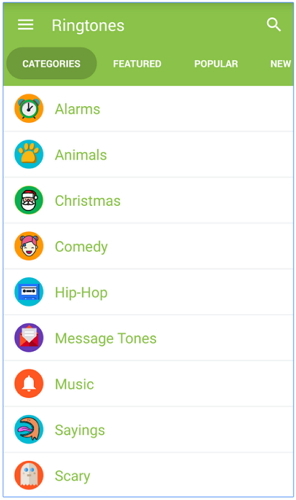 You can also use personalized feature to customize your own ringtones. So download the popular music and tones as free ringtones for your android phone with this cool app! 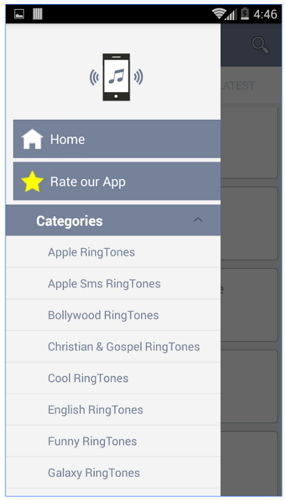 If you are looking for various categories free ringtones for android app, this is the perfect application for you. The audio files from the app are small and latest comparing to the other ringtone sources. 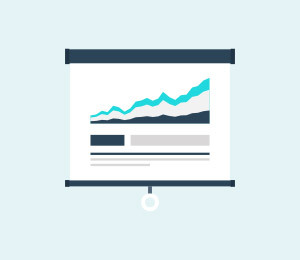 The feature of this application is functional and designed easily to use. Users can also be navigated through the unique tagging feature. 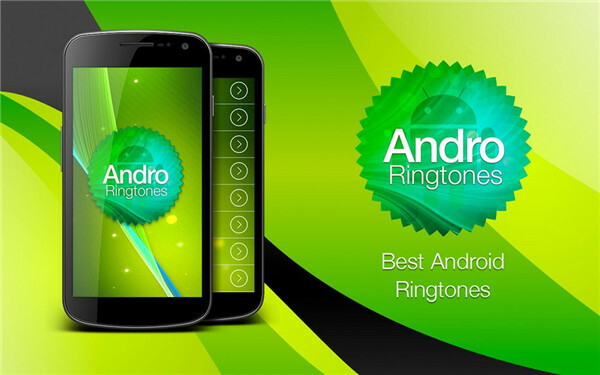 Andro ringtone is a fast and easy application to use for android phones. It contains exclusive collection of all the latest ringtones. 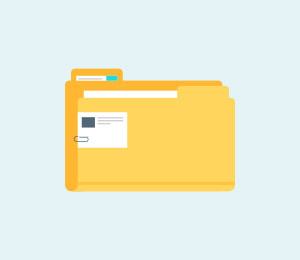 You can also share your selected file via e-mail or social media with your friends. So download this application which is the best free ringtone app for android. 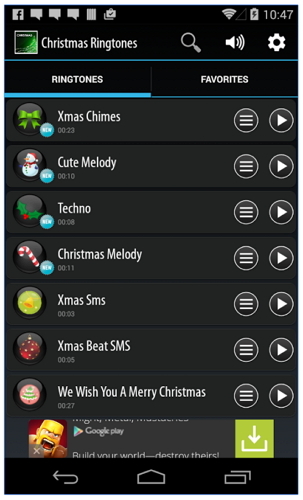 Get ready for the Christmas this year with the Christmas Ringtone app, which is absolutely free. It contains all high quality sounds and ringtones for your android phone. You will find 50+ Christmas music which can be used as caller ringtones or SMS alerts. You can also use them as your alarm tone and start your day with festive melodies. If you are animal lover, than here is an amazing and cool application for you. Animal Sounds Ringtones Free offers you huge collection of different animal sounds. 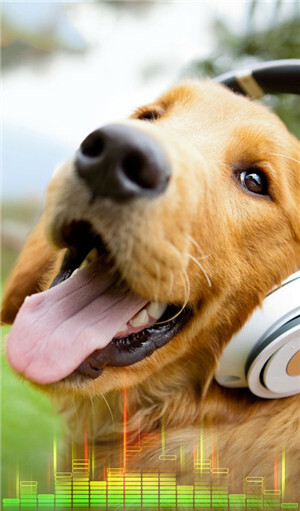 You will find both pet and wild animals sounds which can be used for ringtones, alarms or SMS alerts. So try this application for crazy animal sound effects which will make your phone more fun and interesting. Baby Laugh Ringtones is easy to use interface, which provides you with the best free ringtone app for android. You will find large collection of best ringtones which you can use it on both, mobile and tablet. 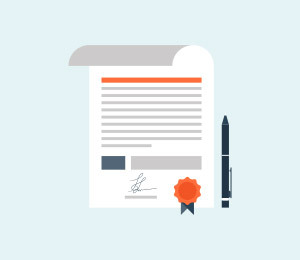 The size of the application is really small and full version is for free. 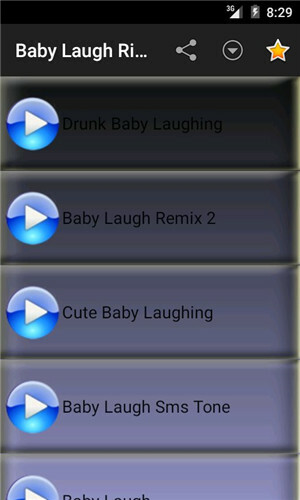 So if you want some cute baby laugh ringtones to make you laugh aloud, download this application. 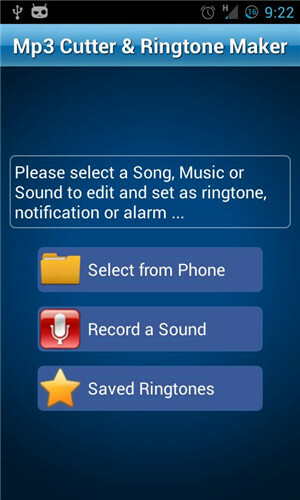 This is another best ringtone app to customize your personal ringtones for Android. 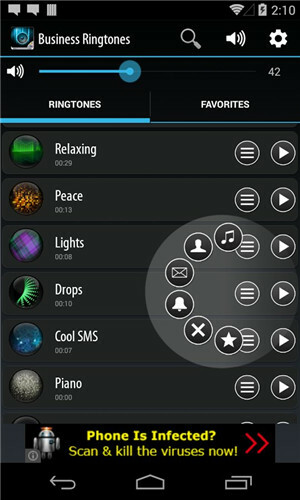 You will find different collections of melodies and sounds which can be used as ringtones and alerts tones. With the app you can set widget button of your favorite ringtones on the home screen as well as the playing timer. Best Love Ringtone is a cool app to download popular love melodies for your android phone. You can use these romantic instrument sounds which can be used for incoming call tones and alerts. 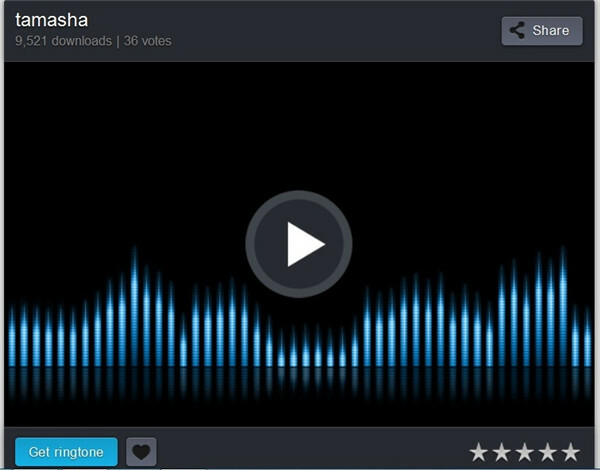 You will find guitar, violin, piano and other sounds which can be used as ringtones. So download android ringtone app now! 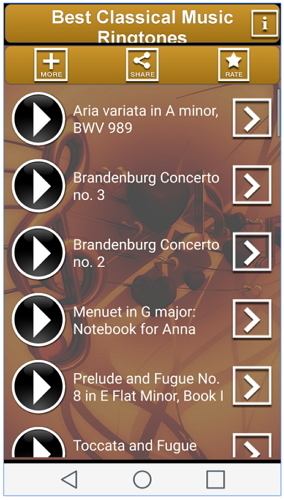 If you are looking for classical music ringtones, this is the perfect app for you! You will find the collection of symphonies, operas, sonata and many more classical sounds. Then download this application and enjoy your favorite ringtone. 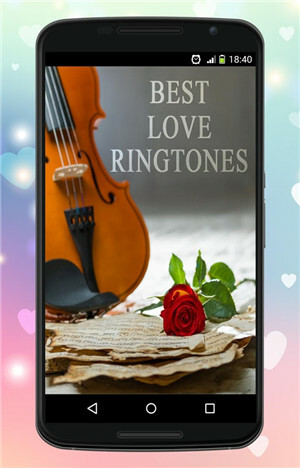 This is one of the coolest free ringtone apps for android which you can use to express your love for classical music. At Popular Ringtones, you can download hundreds of ringtones for free. It contains great collection of free ringtones which can be used for your mobile. The app collect all the top popular ringtones in one place for your Android. Users can enjoy the crazy, funny, funky ringtones from the app and set for your phone easily to show your favourite to your friends. 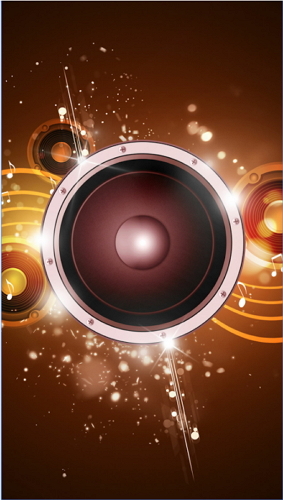 The application Business ringtone is free to download from Google play store. It contains around 150 ringtones which are best to use at your work place and on other official sites. So if you are looking for some professional ringtones, you must try this app! There are very limited built-in ringtones available in Android phones; therefore, it becomes the major requirement of Android users to download certain Apps that makes their usage much more effective. However, as compared to iPhone, downloading ringtones is much easier and fast. 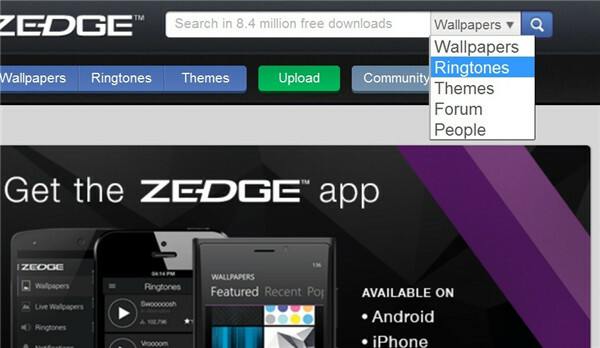 One of the most used Android apps for adding ringtones to your mobile phones is “Zedge”. 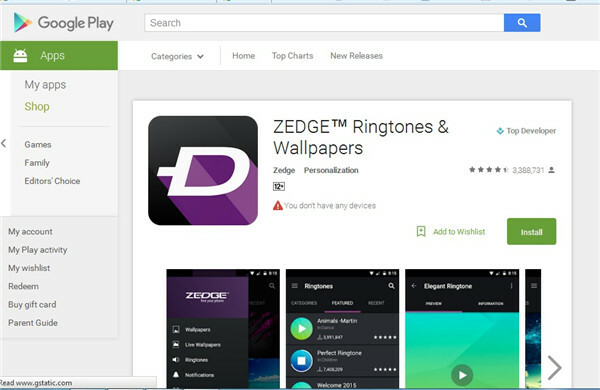 Zedge is free software that can be used by any android user. Step 1 First of all, download free Zedge App from the Google Play store. Step 2 Register yourself by creating an account if you want to email the ringtones to yourself. Also you can also post your ringtones and communicate with the Zedge community. 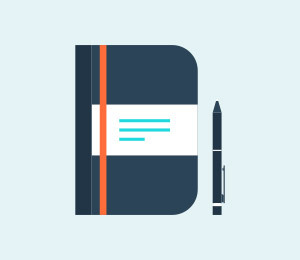 It is important that you provide a valid email address, a unique username and a password using 6 or more characters. 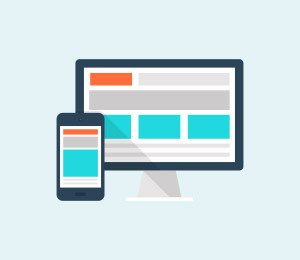 Step 3: As you logon, you are provided with the list of phones and you’ll have to click on “select your device” in the upper right corner of the tab. Step 4: At the top of the page, you’ll find the search box from where you can choose from the various ringtones available. Choose “Ringtones” in drop down menu, which is attached in the right of the search bar. Step 5: Click the name of the song and click on “Get Ringtone” button on the top left corner. 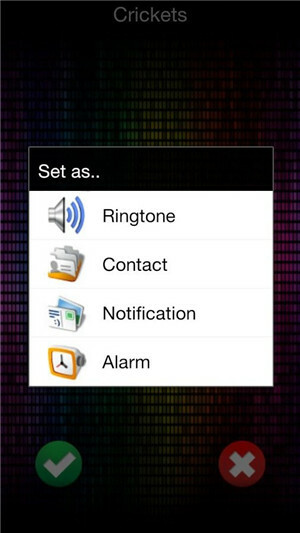 Step 6: As you click on “Get Ringtone”, a dialog box will appear on the screen. The download button will directly save the copy of the file in your PC. 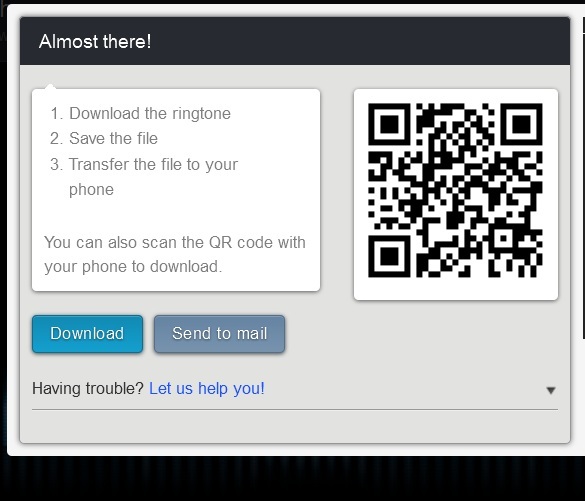 The “Scan QR Code” sends the ringtone to your phone and if you choose “Send to Mail” it will send the ringtone to your email address, from where you can download it later. 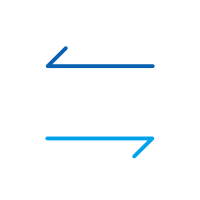 A lot of people do not know there is an Android text to speech technology embedded in their Android device. 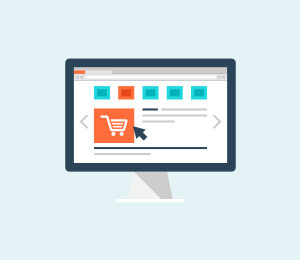 Here is how to use this great technology.